These days we live in a non-persistent (RDS,VDI) workspace world. Devices run from one Golden Image and user data is saved in roaming, streamed or hybrid profiles. This has a lot of benefits, especially in the amount of management that needs to be done. But it comes with a big withdrawal and that is managing Microsoft Office 365 cache. In this blog I will explain what the problems are, how FSLogix Office 365 Container solves this and how to integrate into your Ivanti / RES ONE Workspace environment. Let me first say that I love Microsoft Office 365. It works very easy and is easily setup. I think that every company who has an Exchange server on-premise really needs to think about moving to Exchange online. But as said, there are some problems when moving to Office 365 in a non-persistent environment like Citrix XenApp or VDI. Here are some of the issues you can have in a non-persistent environment with Microsoft Office365. Because e-mail is no longer on the local (network) Exchange server but on the Cloud Exchange Online server, searching through e-mail and working with e-mail is way slower. You can combat this by using OST files. These files will cache your email and make Outlook a lot faster. OST files can easily grow to multiple GB’s so it is not wise to save them in your roaming, streamed or hybrid profile. This will make login speed unbearably slow. What you can do through GPO is move your OST files to a network share like your home-drive. But this will not improve performance, in fact your file server will have to deal with a lot of SMB connections and IO because just opening one OST file can generate hundreds of file server (SMB) actions. And an often seen problem with OST files on the network is that they get corrupted. At the moment using one drive and non-persistent environment is nearly impossible. Because every time you sign in your complete one drive needs to sync all your data back to your roaming, streamed or hybrid profile. Because saving the data in the profile is not an option. Now with the latest one drive client you can sync all your files as links and only download the file itself when opened. But this is not supported on RDS of Citrix XenApp. Citrix recommends to use one drive through the web browser or switch to Citrix Share file. Other problems in non-persistent environments and Microsoft Office 365 are Microsoft Search Indexer won’t work, Slow load of Skype for Business GAL, One note cache etc. read all about it here on the FSLogix site. 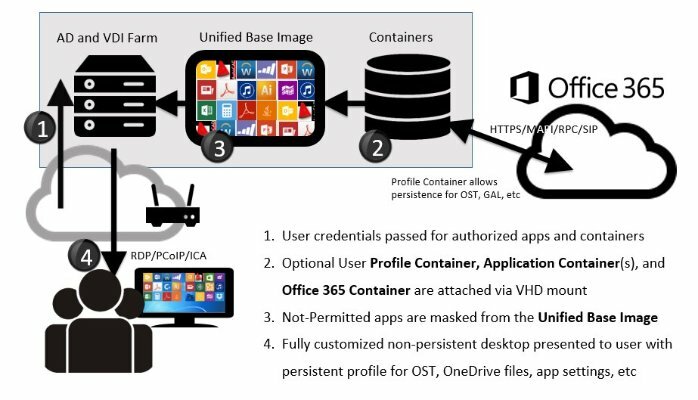 The FSLogix Office 365 container product will create a VHD or VHDX file (virtual hard drive) per user on a network share. When a user signs in his or her virtual hard drive (VHD, VHDX file) container will be mounted. And through a driver some Office 365 profile data that normally goes to the User profile folder will be redirected to the virtual hard drive container. Because mounting the container is only one SMB action for the file server on which the disk is stored the performance is incredible! The data that will land in your virtual hard drive (Container) is your OST, one drive files, Skype GAL, one note cache etc. Your Outlook settings, like signature ,will remain in your roaming, streamed or hybrid profile. I tested the product in my own environment and I went from an Outlook start time of 30 seconds with OST on home-drive to 5 seconds start time with OST in container. And searching through email used to be slow and even emails would be missing but now searching is instantly and finally all my mail is found. Because the virtual hard drive is mounted early in the sign in process it will also redirect your search index and this will make it work on non-persistent environment. So you can enable you Microsoft Search indexer service. Now that we know that we can solve all non-persistent environment Office 365 issues with FSLogix Office 365 containers we need to integrate it into our profile solution. The profile solution I use in my environment is Zero Profile from ivanti / RES ONE Workspace. This is a hybrid profile solution. Every time a user signs in to the server they get a mandatory portion of profile (mandatory profile or local default profile) and the Zero Profile technology adds the personal profile data to it. In my environment OST files are stored in the home-drives (network location) through policy. So now to integrate the FSLogix Office 365 Profile containers. 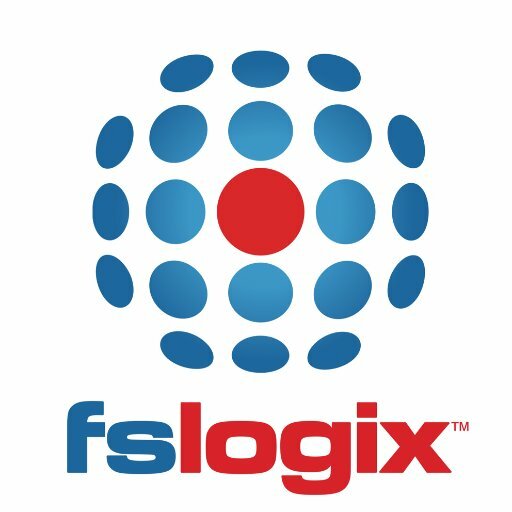 I use an unattended installation task in Ivanti / RES Automation to install FSLogix on my environment. The install parameters are: /install /quiet /norestart ProductKey=YOURKEY for the FSLogixAppsSetup.exe. After the installation I also turn on the WSearch service so that Windows Search Index will work. 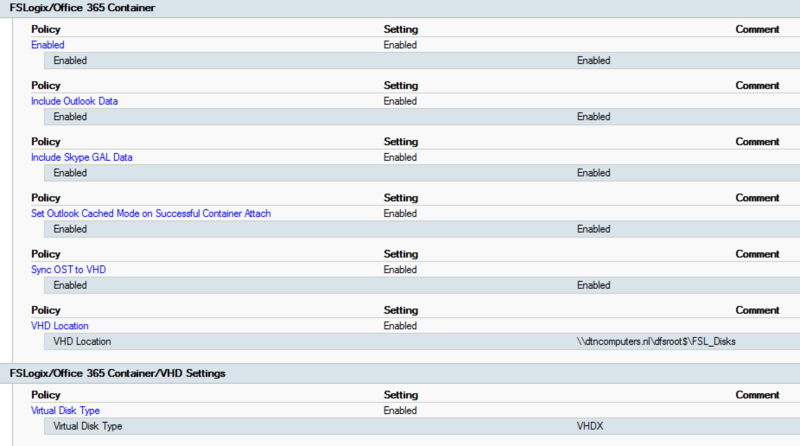 Make sure users have write acces to the VHD location. Remove all User Settings from your one drive application. In the Outlook User Settings remove the %APPDATA%\Microsoft\Outlook Folder tree. In the Skype for Business User Settings remove the %APPDATA%\Microsoft\Office\16.0\Lync Folder tree. In the One Note User Settings remove the %APPDATA%\Microsoft\OneNote Folder tree. The last thing we need to do is make sure that there is no more policy object which sets a network location as default OST location. This is in the outlk16.admx under Default location for OST files. In the same Admx file you can enable Use Cached Exchange Mode for new and exsisting Outlook profiles. Thats it ! Now sign in again with your user and start up outlook. You can check if the OST file is working correctly under Account settings – Data Files. Users in the include group will have the container enabled and the user in the Exclude group will have the container disabled. By default everyone is in the Enabled group. The tray tool can easily be added to the start menu of a user with ivanti RES ONE Workspace. The tray tool stop light will stay yellow when using only Office 365 Containers and contains the log of all users.